Congrats on taking your app live! This is a huge milestone, you should be proud. 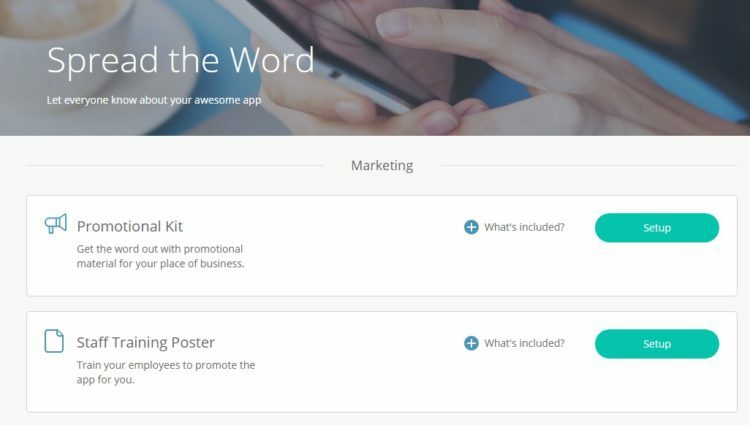 You’re probably thinking, “What’s the next step?” Now, it’s time to promote your app and spread the word about all the cool features that are available. The more users that download, the more beneficial it will become for the business. With Cardiff, we are happy to announce the release of our new Promotional Kit. Use these tools to effectively market your app and gain users! Log into your app and navigate to Grow in the left side menu. Select the drop-down and go to Promote. Here you’ll see two options, Promotional Kit and Staff Training Poster. 1. The Promotional Kit is an all in one solution to create seamless promotional material for your business. The kit includes a Poster, Table Tents and Table Cards. 3. Each option comes with default text and offers. To customize the text, select Edit and add your own promotional offer. Under Edit, you can also choose to add the app icon or QR code, as well as adjust the accent colour and reset the template. 4. Next, select the accent colour for your material. We recommend sticking to the primary colour used within your app for a cohesive design. 5. Lastly, select Download. A zip file containing the Poster, Table Tent and Table Card will be downloaded to a computer. A PDF with instructions on printing your promotional kit will also be included. Additionally, don’t forget to market the app on Social Media! Post your app listing URLs on your Facebook, Twitter, Google+ and blog.